I was inspired to write this by a blog that I follow (Rachel Held Evans). I haven’t told the entire story here. How do you write about such a life well-lived? I have simply tried to give you a snapshot of this amazing woman, my grandmother. Every time I say your name in prayer – which is practically all the time – I thank God for you, the God I worship with my whole life in the tradition of my ancestors. I miss you a lot, especially when I remember that last tearful good-bye and I look forward to a joy-packed reunion. That precious memory triggers another: your honest faith – and what a rich faith it is…God doesn’t want us to be shy with his gifts, but bold and loving and sensible. Bold, loving and sensible. Three words that very accurately describe my grandmother. Her grandchildren knew her as Mimim. Her sons called her Mother. Her friends, Emmie. She lived her life boldly, loved with her whole heart, and was sensible with what God entrusted her with. She was a kind and loving woman and loved nothing more than to love others – and fiercely loved those she called family. I was one of the lucky ones. A special group of her favorite people. I was one of her grandchildren. She loved each of us for who we were and sought to make each of us feel special and cherished. We thought we were unique in how she loved us because she loved each of us so specifically but the funny thing is – that is how she loved everyone. As a child and young adult, Mimim told me stories of her life. She lost her mother at age 5 and was raised mostly by her two aunts. From the stories she told me, those two women were tough but definitely taught Mimim how to be a strong woman. A product of the Great Depression, she learned at a very young age to make the most of what she had and to never waste anything. 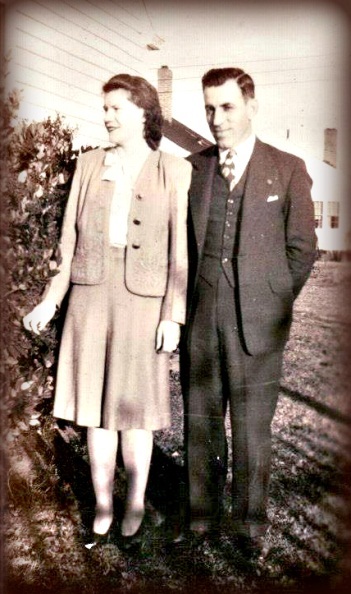 As a young woman, she met the love of her life, J.B., and they were married when she was 23. She used to tell me that he fell in love with her because she made tasty cakes and treats. I think he must have loved her for her own natural sweetness. Together they had three sons and ventured into business together. We have a collection of home videos from when my father was a boy and in those black and white clips you see a family, full of love and adventure in the everyday, normal routine things. When she was 45, my grandmother’s world forever changed as she lost the love of her life to a heart attack. Her oldest son Danny was a sophomore at Georgia Tech, her middle son Jimmy (my dad) was a junior in high school, and her youngest son Rufus was in first grade. JB left her a $10,000 life insurance policy and a business that was $30,000 in debt. When my father graduated from college six years later she still had the $10,000 in the bank and the business debt was paid. Her two oldest sons graduated from college with no student loan debt and her youngest attended a private high school. She knew how to manage her finances well and she did so quietly and deliberately – as she did with her business. When I met the love of my life, I had no idea that he would be my husband one day. I think Mimim knew he would be the first time she met him. She instantly welcomed him into our family and loved him as one of her own. Once I realized he was a “keeper”, I began to understand the depth of the love that my sweet grandmother must have felt for her beloved JB. She told me more than once that if I didn’t hurry up and marry him, she was going to figure out how to – she loved him that much, too. A couple of months before our wedding, Mimim was on a trip with her sisters. She began to experience some dizziness when she got home and after a trip to the hospital and many tests it was discovered that she had a brain tumor. She was able to be a part of our wedding and the start of our life together. In December of 2004 she had surgery to remove the tumor and had a steady recovery and was able to come home and visit with family and friends. And then in March of 2005 we found ourselves gathered around her hospital bed as the machines were turned off. But she wasn’t really gone. She lives through those that loved her and knew her. My daughter told me just this morning that Mimim was one of the first people that she wants to meet in Heaven because she feels like she already knows her by heart. I think of her daily and pray that my love for friends and family comes close to the love that she showed us so boldly. Mimim was a true, noble, and giving woman. And I am so thankful that I was one of the lucky ones that directly experienced the depth of her love and kindness.